1. Configure enteprise switches to allow VLAN 10 to be transmitted. All enterprise switches in our case have the same configuration. You can recall VLAN configuration looking at the following post VLAN, trunk, VLANIF (SVI) on Huawei switch. 2. Create VLANs 100 and 200 on all ISP switches. Below SwitchA as an example. 3. 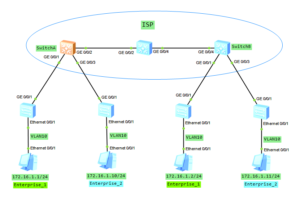 Allow VLANs 100 and 200 to be transmitted between ISP switches. 4. 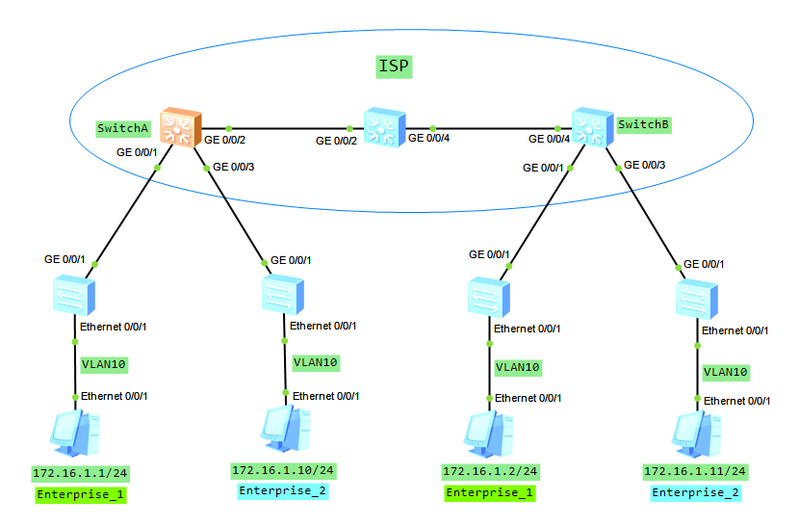 Set interfaces of SwitchA and SwitchB towards Enteprise_1 and Enterprise_2 as QinQ with VLAN tag 100 and 200 accordingly. 5. Check communication between branch offices in Enterprise_1 and in Enterprise_2. As you can see there are 2 VLAN tags inside ISP network so QinQ is working correctly. 6. Notice that communication between Enterprise_1 and Enterprise_2 is blocked.